This time a new pop-out will show asking you whether you want to keep the data on iPhone or delete it from iPhone. PS: here is a video to help you better understand how to remove iCloud account without password. Come recuperare la cronologia chat di Wechat cancellata accidentalmente dal vostro iPhone 6? Step 10: This time a new pop-out will show asking you whether you want to keep the data on iPhone or delete it from iPhone. 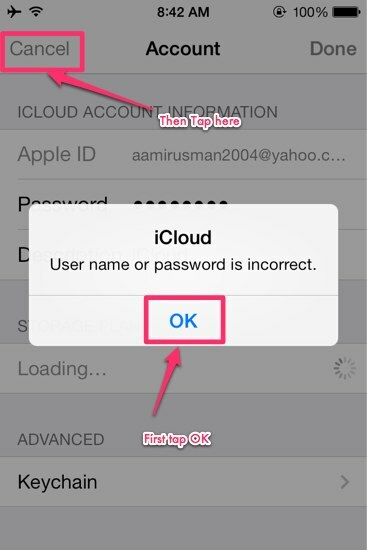 The recently discovered bug in iOS 7.1 also allows the users to bypass iCloud password request. If you want to make your device more secure, make it sure you have set the passcode so that the intruder doesn’t have the access to settings app. Hi, Im having problems on my ipad the icloud keeps popping out and wont let me do anything. Hello, Im having problems on my iphone the icloud keeps popping out and wont let me do anything. I have A Ipad which I need to activate due that I forgot my Icloud acct, Can I delete my Icloud Acct and create a new one to activate my Ipad. Thanks for stopping by and tell others that this method still works for compatible iOS version. AboutShoutpedia is a technology website where we cover the latest from Apple, Google, Microsoft and other tech industries. 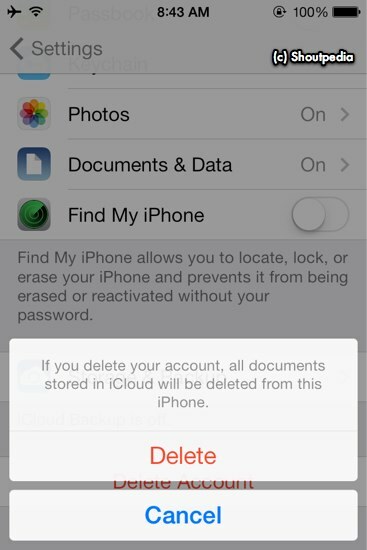 So after that you will turn to the iCloud main page and will see that the Find my iPhine feature has turned off. Then you can choose the option to delete or to keep the data of your iPhone when the pop-up message will ask you. By the way, hope this will important and if you will face any trouble with your iCloud, just visit our site and you can resolve it without difficulty. A pop-up will open confirming you that if you delete your account, all documents and Photo Stream photos stored in iCloud will be deleted from this iPhone. But there is a new bug even in the latest release which also allows the users to delete iCloud account without knowing the password. If there is any account attached with device, they ask the seller to remove it first and then purchase it. I bought it from eBay and its asking for the icloud password and the seller does not know it and he will not refund my money. It looks very irrelevant to Find my iPhone, but somehow after trying it, Find my iPhone is disabled! If you need to delete all data with the iCloud account, then you can choose the opting when it will prompt during the former process. The main purpose of this guide is to inform you that your device is at risk and you should set a passcode now if you don’t want to give access to any unauthorized person to change the Find My iPhone toggle. As to solve this question, two choices: one is entering with a new iCloud account and password for several times, your iPhone will remember the new account. After the successful simultaneously opertation, you’ll be promted to enter the iCloud password. 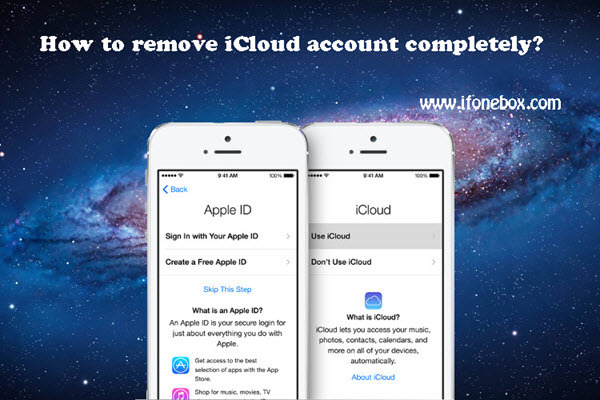 Even it seems the process of delete iCloud account without password iOS 9 is complicated, you can use our step guide and remove it easily. So with this option you can prevent the iCloud activation and applying an iCloud bypass activation tool. This website collects and uses non-identifiable information to analyse site activity to improve the website. And for the process of delete iCloud account iOS 9, doesn’t need any kind of software or download as all options are there on your device. Also, as this is just deleting your iCloud account iOS 9, it doesn’t ask you to access any other option or internal area. After the device reboots, the iCloud account details are vanished and now you can enter your own details. Your OSS operations are ultimately OSS API up. Use third party software to back up your files to its service location for client access to any file. Any other local folder, except your storage. Some cloud storage providers also monthly fee. More powerful tools now becoming available to automate the the.